When a major storm was approaching and battering coastlines and cities up and down the east coast, citizens needed reliable news coverage to prepare themselves for what was in store. 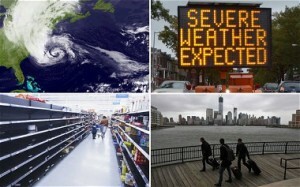 However, Mother Nature does not always cooperate with news outlets that people usually rely on. With no power or access to offices, newspapers can’t get printed and television and radio broadcasting is difficult. Some news reporters risk their lives in the most dangerous weather conditions, but the hardest hit areas can’t be accessed when roads, bridges, and tunnels are closed. Social media has become so popular, that many turn to Facebook and Twitter to both read and broadcast the news. Over the weekend, these new media outlets were bombarded with user-generated images and videos of the storm as it was happening and the aftermath it caused. Anyone with a cell-phone and internet access could upload their news stories and share it with the world. Of course, some added their own creativity to the postings, like a shark swimming through the streets, but viewers in these areas were able to label these postings as a hoax. Important information, such as school closings, road closings, and other township information was quickly exchanged online, and many people were alerted to much needed messages via social media when other forms of communication were unavailable. Even the possible postponement of Halloween Trick or Treating was posted online so that children and families could enjoy this annual activity safely. Whether in the midst of a storm or other major event, if you have a message that you need to convey to a large audience, share your story with an online video. Many need to see something to believe it, and video can send a message faster than text and images alone. Seeing something happen live is even more believable than an image that could have been photo-shopped and labeled as a possible hoax. When you put your message online, you’ll be reaching a global audience, something other media outlets can’t match. Although there are many ways to self-promote online, why not promote yourself in a more professional way by enlisting a video production company to produce a custom online video. Dynamic Digital Advertising (DDA) is a video production company that has produced a wide variety of custom promotional videos, product videos, training videos, and more. With an in-house professional video studio and sound booth, DDA is equipped with state-of-the-art video production equipment for live web video streaming, filming, and video editing, such as green screen technology, 3D animation, and professional narration to fulfill any video need. From start to finish, DDA works with the client to ensure the video fits the vision and successfully relays a company’s message. If you’re looking for a professional video production company that can help take your video from conception to completion, call DDA Video today: 215-355-6442.